From American Thinker, by Russ Vaughn, 01/30/13 – If you are a reader of comments here at American Thinker then you have probably noticed an increasing use of the term molon labe. For those of you unfamiliar with the term and too busy (or too lazy) to look it up, I’ve done it for you. It is a Greek expression first attributed to King Leonidas of Sparta when the Persian invader Xerxes I, prior to the Battle of Thermopylae, demanded that the Spartans lay down their arms and submit to him. According to multiple web sources, molon labe now translates to an unwavering, “Come and take it,” as in Charleton Heston’s defiant challenge at the 2000 NRA convention, “From my cold dead hands.” Considering that the expression, in one form or another, has been quite forcefully and purposefully addressed to would-be tyrants by very strong and admirable men, from Leonidas to Heston, many of us find a sense of oneness with men of such resolve, embracing their defiance and applying it to our own determination to defend our constitutional right to keep and bear protective weaponry free from federal constraints. As James Webb has documented in his seminal work, Born Fighting, How the Scots-Irish Shaped America, we Americans out here in fly-over country are not a people ever to be persuaded to surrender our arms. As descendants of those highlanders and frontier mountain settlers who kept weapons close to hand to ensure their survival, America’s largest ethnic group feels a deep ancestral imperative to do the same. No wannabee elitist, utopian pol attempting a socialist Sherman’s March through our national heritage is ever going to change that attitude in these millions of Americans. Many citizens of fly-over America may have no clue as to the meaning of the term molon labe, but the essence of the concept is inherently embodied, and embraced in every fiber of their beings. Dismissed by the liberal coastal elites as bitter clingers to their God and their guns, they are in fact that huge segment of America, both comfortable with and accustomed to, the everyday presence of firearms in their homes and their hands, and most importantly, confident in their ability to use them when threatened by criminals or tyrants. Tens of millions of contemporary Americans are descended from those Scots-Irish highlanders and Appalachian frontiersmen, a people renowned as born fighting. 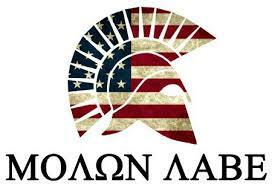 Molon labe may be Greek in its origins but it is thoroughly Scots-Irish in its present-day application.